I have acquired many Eurovision Song Contest singles through the years, especially in the last few years. The more I have collected, the more obscure the new additions get. I'd never seen the 1974 entry from Finland before last Saturday - and now I saw this single with two different dealers during the Utrecht record fair. I bought this single the first time I saw it, which is just as well since the other dealer asked two more euros for it. 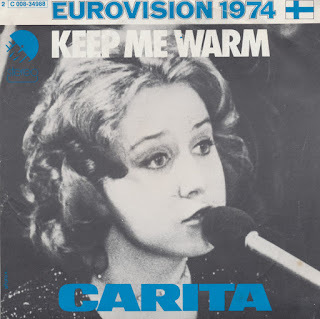 Carita Elisabeth Holmström was born on February 10, 1954 in Helsinki. She represented Finland with the song 'Keep me warm'. She finished in 13th place in a field of 17 competitors. Luxembourg is a small country, which is why it is allowed to attract artists from other countries to represent it during the Eurovision Song Contest. In the history of the Contest, only eight native Luxembourgians have represented their own country. One of them was Monique Melsen, born on February 24, 1951 in Ettelbruck. In 1971 she sang 'Pomme pomme pomme' ('Apple apple apple'), a song about eating an apple. Yes, this is how simple a song can be. Doing so reminds her that it is spring, which causes her to wonder if she will find love during that season, or whether she will only find 'the snake'. The song finished on 13th place, in a field of 18 contestants. 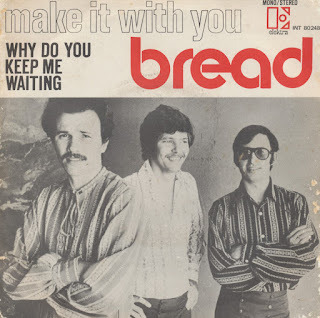 Hard to believe, but the Bread song 'Make it with you' was recorded by only two people: Mike Botts (drums) and David Gates (vocals, acoustic guitar, electric guitar, bass & strings). Gates also wrote the song. It was released in June 1970 and became their first top 10 hit in the USA, peaking at the top of the US Billboard Hot 100 chart. The single also did well in the UK (where it peaked at number 5), Canada (number 2), New Zealand (number 6) and Australia (number 7). In France, where the single I bought was made, it didn't chart at all. Maria Manuela de Oliveira Moreira Bravo, (known as Manuela Bravo) was born in Queluz (Sintra) on December 7, 1957. She made her first public apperarence when she was only 5 years old in Cinema Éden. When she was 15 years old, she released her first single with two songs composed by José Cid, 'Nova Geração' and 'Another Time'. 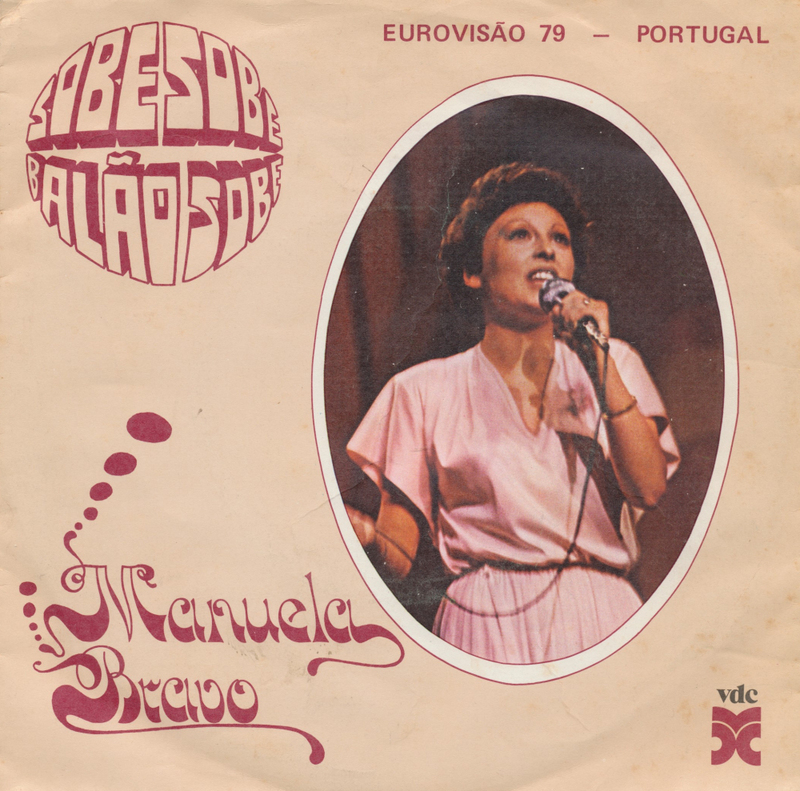 In 1979 Manuela Bravo won the Portuguese national final for Eurovision with the song 'Sobe, sobe, balão sobe' and represented her country in the Eurovision Song Contest. She finished in 9th place in a field of 19 competitors. When you listen to this single now, the song sounds a bit dated. 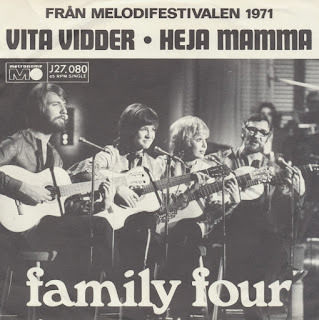 In 1971 Sweden was represented at the Eurovision Song Contest by Family Four. With the song 'Vita vidder' they managed to get to sixth place in a field of 18 competitors. 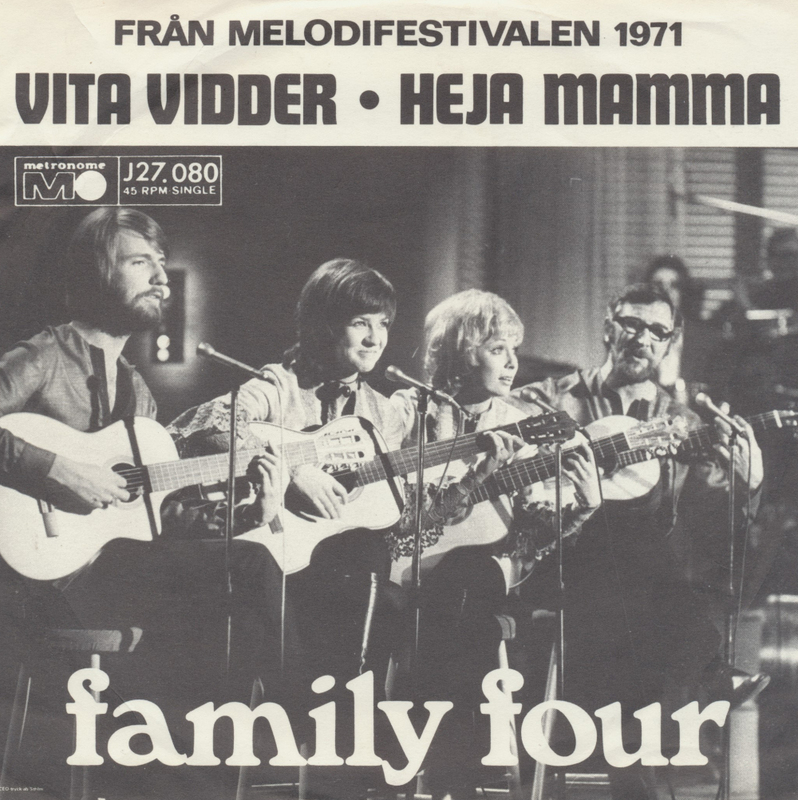 Family Four consisted of Berndt Öst, Marie Bergman, Agnetha Munther and Pierre Isacsson. They went on to represent Sweden again the next year, with the song 'Härliga sommardag'. Marie Bergman was no stranger to Eurovision after this: she returned to the Eurovision stage together with Roger Pontare in 1994. 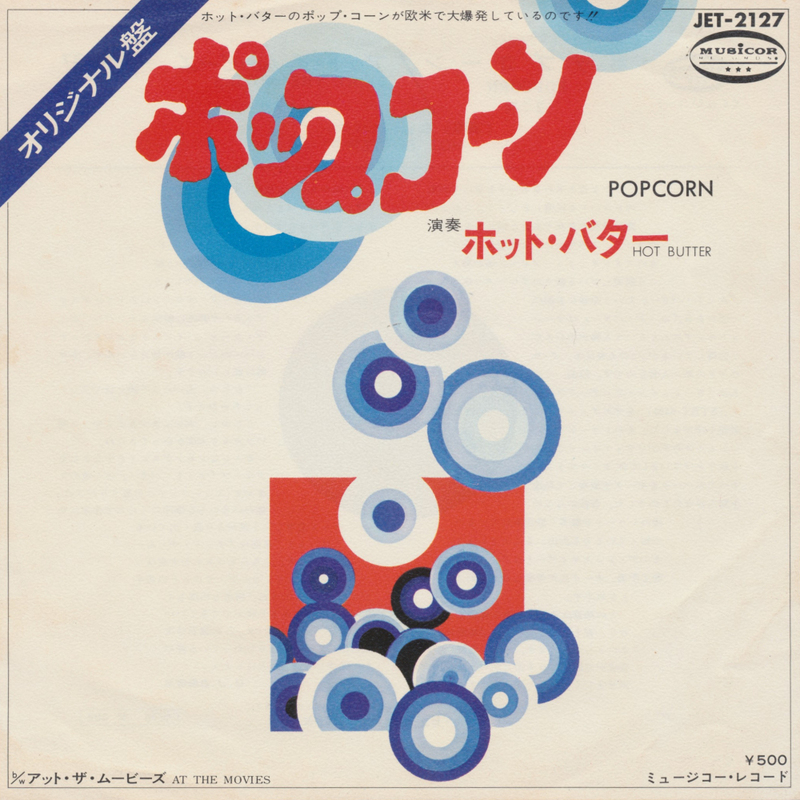 My copy of 'Popcorn' by Hot Butter, described on this blog ten years ago, wasn't very interesting to look at for its lack of a picture sleeve. I think I have compensated for that now. I recently ordered a promotional 7" single of Kim Wilde's 'View from a bridge' from Japan (Do I really have to describe all my Kim Wilde singles on this blog? 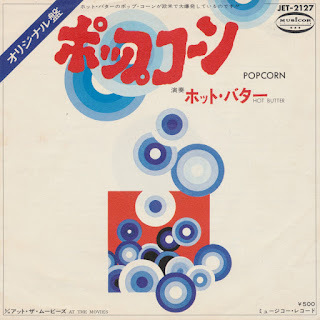 I have decided not to) and found this Japanese copy of 'Popcorn' for just a few dollars extra. I decided to buy this one as well, just because my 'Popcorn' collection is something I am particularly proud of. It may not be a complete collection, but this single is rare enough to want to own it. On June 6, 2017 Sandra Reemer passed away following a long battle with breast cancer. She had a long and interesting career, not least because she appeared at the Eurovision Song Contest three times, representing the Netherlands. 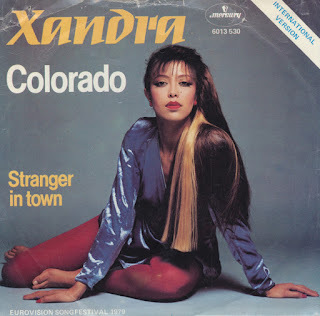 The last of her appearances was the 1979 song Colorado, which I bought as a single in 2002. 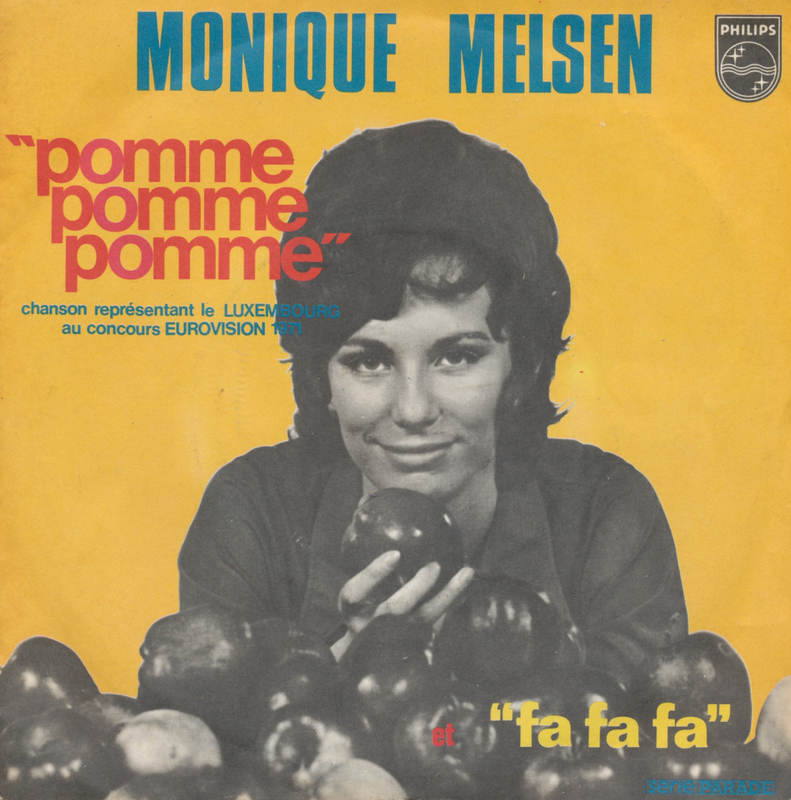 That single featured the Dutch version. The single featured here today was also released at the time, featuring a version in English. Like the Dutch version, this one was written and produced by the brothers Rob and Ferdi Bolland. 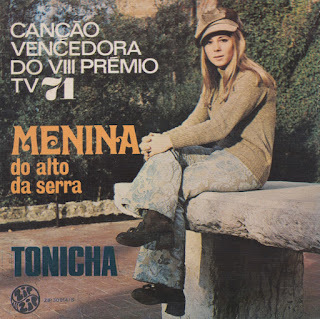 Tonicha was born as Antónia de Jesus Montes Tonicha on 8 March 1946, in Beja, Alentejo, Portugal. She represented Portugal in the Eurovision Song Contest 1971, with the song 'Menina do alto da serra' ('Girl from the country mountain'). She finished on ninth place in a field of eighteen competitors. 'Menina do alto da serra' is a classic Eurovision song, the kind you don't get to hear anymore these days. It's beautiful and melodious. This copy comes straight from Portugal, where I ordered it, and despite its age it looks almost like new. 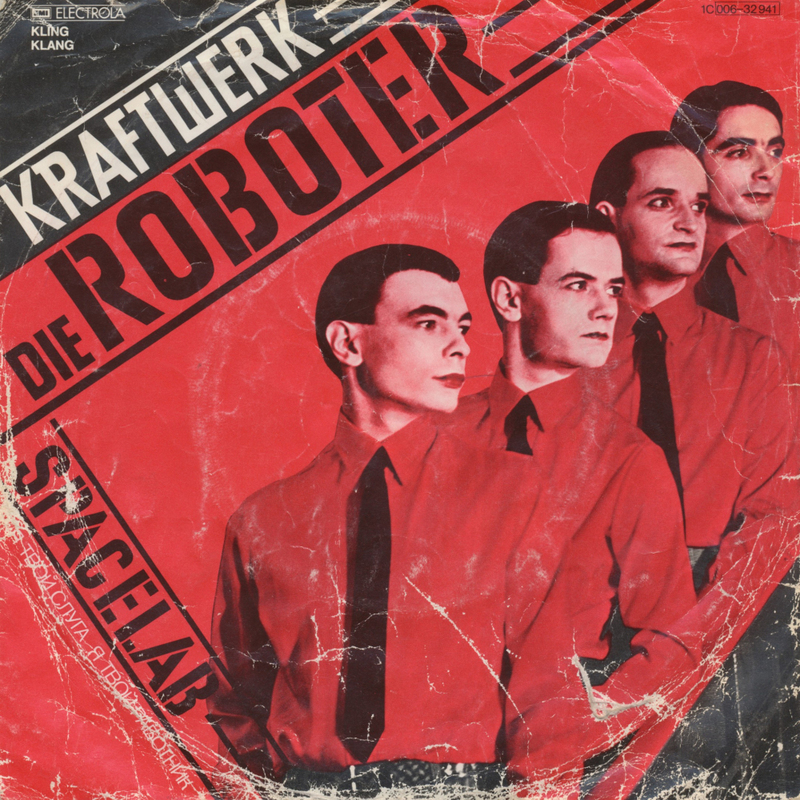 Kraftwerk singles are pretty rare, so whenever I see one for an affordable price I leap at the chance to own it. Even if, in this case, the state of the sleeve is a bit questionable. 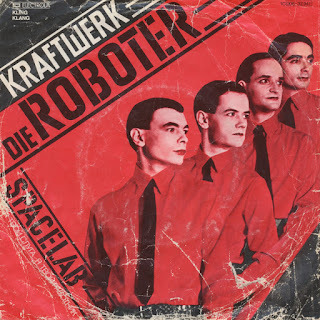 'Die Roboter' is the original German version of the track better known as 'The robots' in English speaking countries, and it was released in 1978. Taken from the album 'Die Mensch Machine', the single reached number 25 in the German singles chart and number 23 in Austria. The track was remixed for the album 'The Mix' in 1991 and got to number 18 in Germany then. Svenne Hedlund and Charlotte Walker met in 1967 when Svenne was the vocalist in the band Hep Stars, which also included Benny Andersson who would go on to form Abba. They spent time together during the Swedish leg of Lotta's concert tour with the American band the Sherrys. Upon Lotta's return to America, the pair missed each other so greatly that Lotta soon travelled back to Sweden; this time with her three children. Seeking parental approval, Lotta also brought her mother to meet Svenne. After the Hepstars broke up and Abba became a phenomenon after winning the 1974 Eurovision Song Contest, Sven and Charlotte competed in the Swedish national finals for the Contest in 1975 with 'Bang-a-boomerang'. The song was composed by the male members of Abba, who didn't want to represent Sweden a year after having won the contest, so they gave the duo the song instead. It became a big hit in Scandinavia. 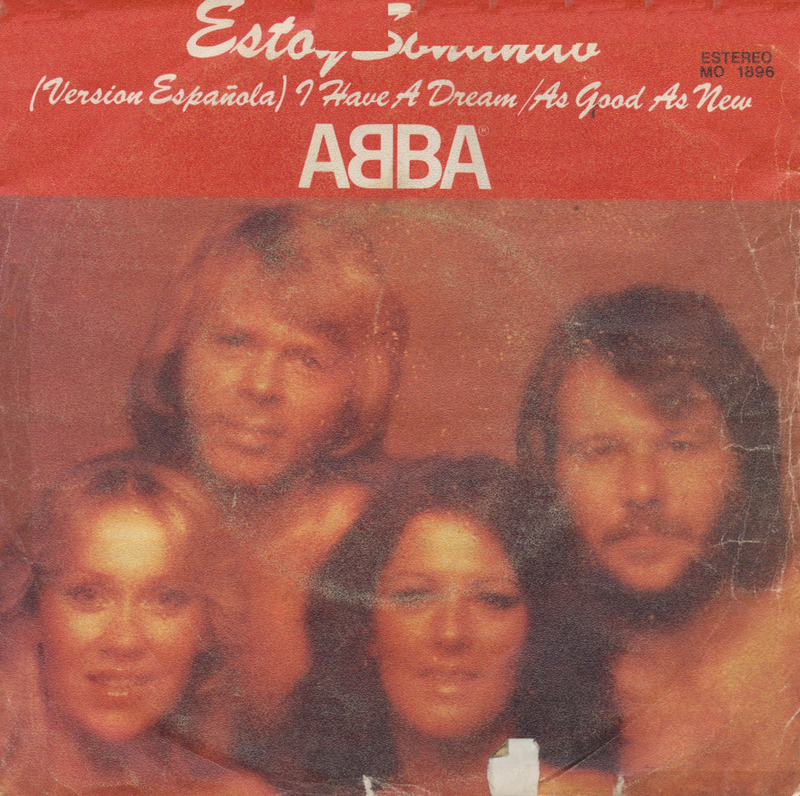 Abba recorded the song as well, but from a Scandinavian perspective, this is primarily a Seven & Charlotte hit. There's been a lot of attention for Kate Bush these last few months, on the occasion of her 'Remastered' box sets. 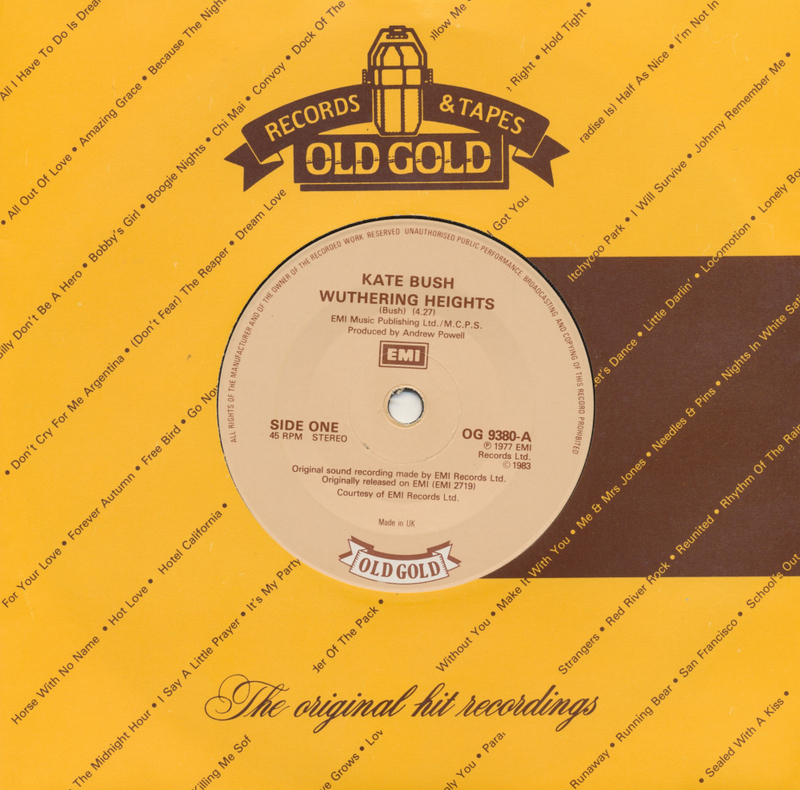 Re-releases of Kate Bush music have been very scarce - between 1978 and now there has even only been one official compilation album. Which is why this 'Old gold' single is a bit of a rarity too. It presents Kate's first two hits on one single. It was released in 1983, while EMI also released the 7" singles box set 'The Single File'. Interestingly, this single features the single version of 'The man with the child in his eyes', which has never been released on any Kate Bush CD until now (although it does appear on a compilation CD of love songs somewhere...). 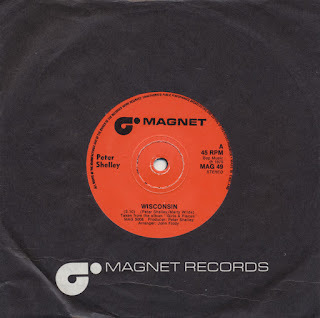 The song 'Wisconsin' appears as the B-side of the single Little Julie, which I bought just six months ago. And here's the UK single of that very song, this time on the A-side. 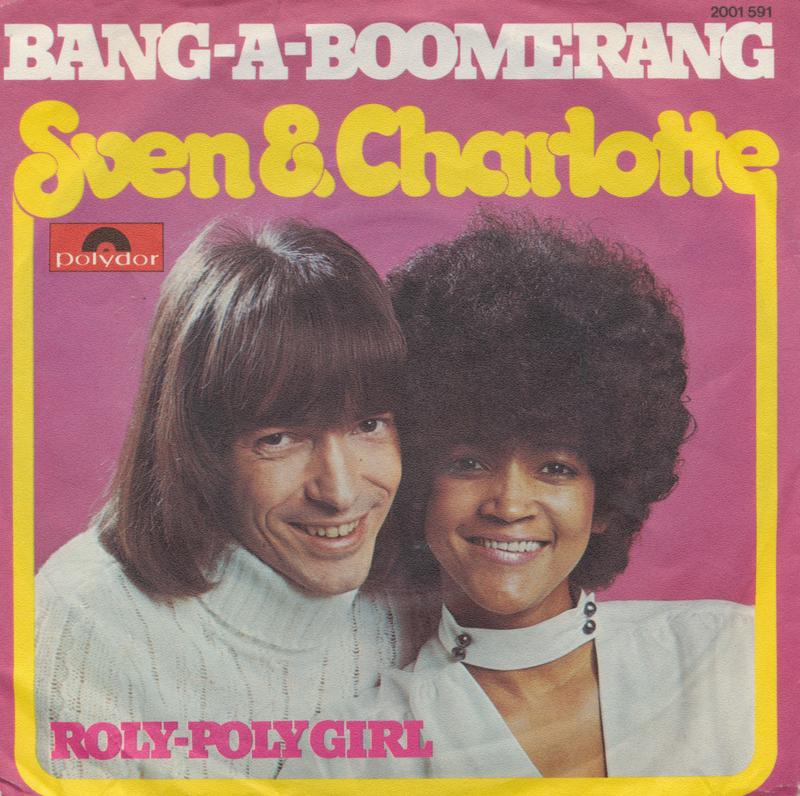 Released on the Magnet label, this single did not reach the UK charts, contrary to 'Gee baby' and Love me love my dog, which were minor hits in the UK. This single is mainly an addition to my ever expanding Marty Wilde collection, but it has to be said that 'Wisconsin' is a beautiful composition. Several singles from the legendary 'War of the world' album by Jeff Wayne have already been featured on this blog, but today's addition to my collection is especially rare. While I was browing the Discogs website - I have done that a lot lately - I discovered this promotional EP, released in New Zealand only. Normally I wouldn't consider buying a single just like that, but it was cheap and the same seller also had an extremely rare New Zealand pressing of Kim Wilde's 'Kids in America'. It was simply an offer I couldn't resist. The Eurovision Song Contest isn't often won by the best song, but in 1963 it happened: 'Dansevise' by Grethe and Jørgen Ingmann was the winner that year, representing Denmark. It is one of my favourite Eurovision tunes of all time. What I didn't know was that previous Eurovision winner Corry Brokken (who represented the Netherlands when she won with 'Net als toen' in 1957) recorded a cover version of the song in Dutch. Entitled 'Danswijsje', the lyrics stay fairly true to the original and the music certainly does too. 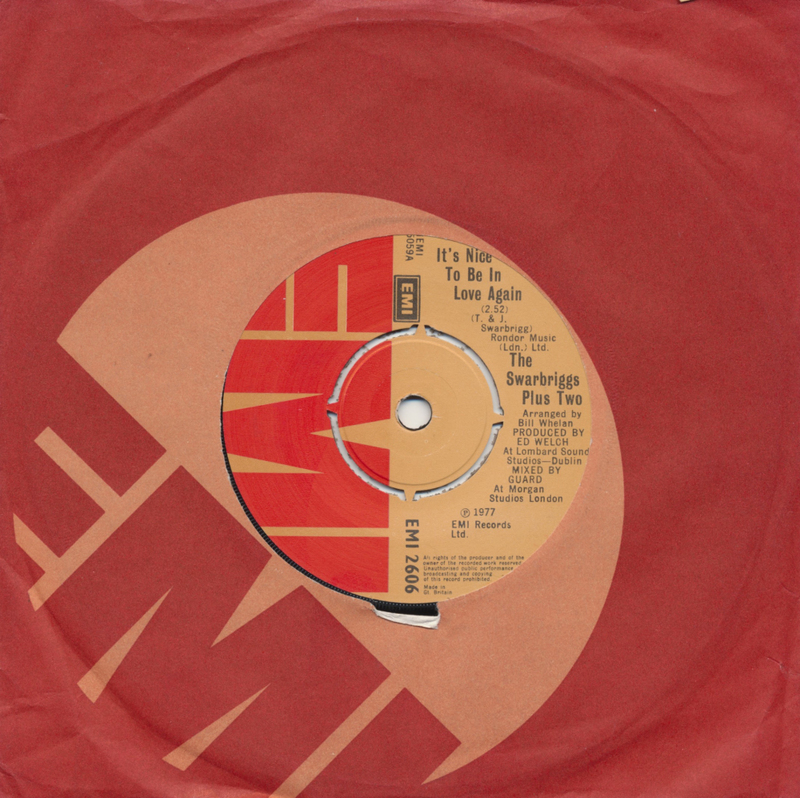 The B-side is called 'Ga niet weg', and that is a cover of the Swiss entry from 1963: 'T'en va pas' by Esther Ofarim, who represented Switzerland. The orchestra on this single was conducted by Jack Bulterman, who also conducted that legendary Dutch jazz ensemble The Ramblers. The Irish entry in the Eurovision Song Contest in 1977 was performed by the Swarbriggs Plus Two. Following on from The Swarbriggs' first appearance at the Contest two years earlier, Thomas (Tommy) and John James (Jimmy) Swarbrigg recruited Nicola Kerr and Alma Carroll to form the bizarrely named quartet The Swarbriggs Plus Two. They were dressed in dark blue outfits, with the two men wearing their blazers of that colour over white suits. The song was performed first on the night. At the close of voting, it had received 119 points, placing third in a field of 18 competitors. 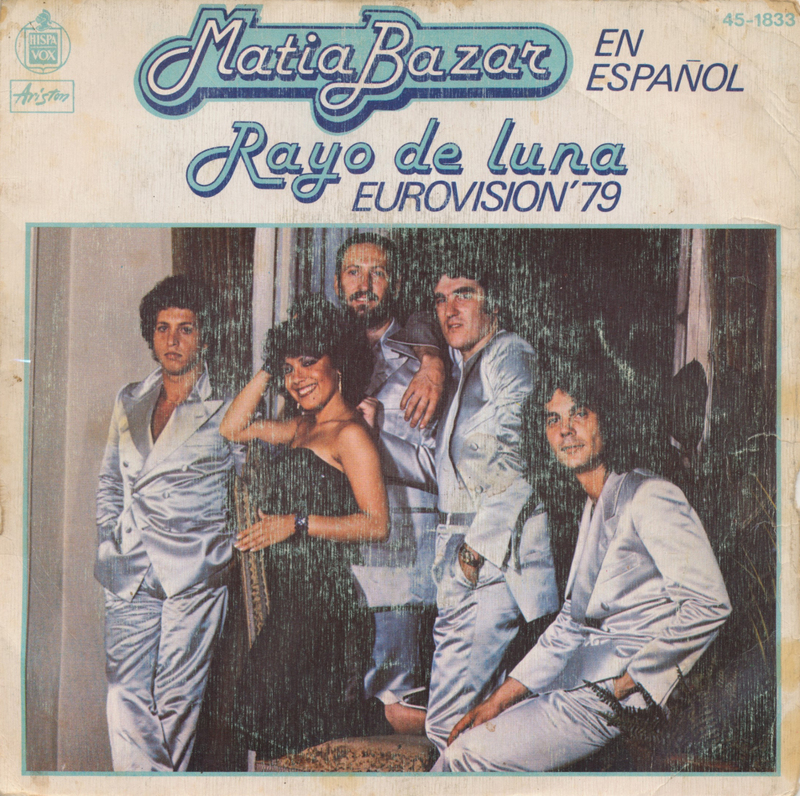 The Italian band Matia Bazar has had a few hits in Europe, but their participation in the Eurovision Song Contest seems to have been forgotten by many. In 1979 they represented Italy with the song 'Raggio di luna'. They recorded the song both in Italian and in Spanish - and the single containing the Spanish version appeared when I was ordering some singles from Spain recently. Of course I wanted to have it, because it's always a delight when an artist records their own song in a different language. 'Estoy sonando' is of course the Spanish version of 'I have a dream'. With the help of Buddy and Mary McCluskey the ballad was turned into a warm-blooded version for the Spanish speaking market. I ordered this single along with a few others from Spain. The problem with online ordering is illustrated right here: this was by far the worst sleeve of the whole package. You can't always know what you'll get. The might be an occasion to replace this single, but I am not rushing it. For now this is good enough to have - a nice curiosity doesn't always need to be perfect. When Severine won the Eurovision Song Contest in 1971 with 'Un banc, un arbre, une rue', she also recorded the song in other languages. I already found the German version ('Mach die Augen zu (und wünsch dir einen Traum)') in 2010, and yesterday I suddenly found the English version. 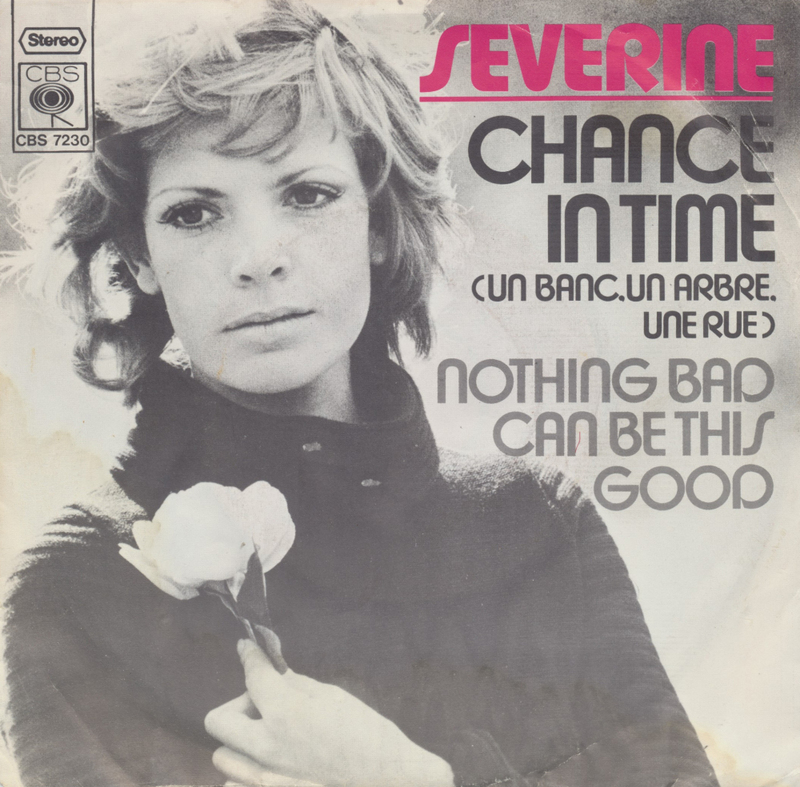 'Chance in time' was released in several countries, and this is the Dutch pressing. Now all that's left for me to find is the Italian version, 'Il Posto'. I am sure it will come to me some day. During my life I have shopped for singles in many strange places. Yesterday was a very strange one indeed. Two days ago I went to the circus with my daughters, and discovered a record shop inside the tent. Turns out the organiser of the circus also acquired a record collection, to sell during the event until today. With two children by my side I didn't have time to browse all the singles, and so I went back yesterday. 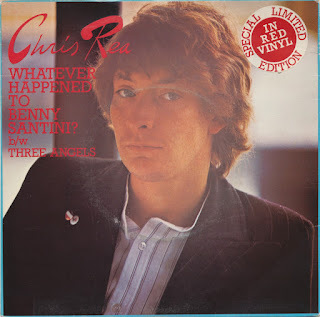 My first find was immediately a good one: this Chris Rea single on red vinyl. 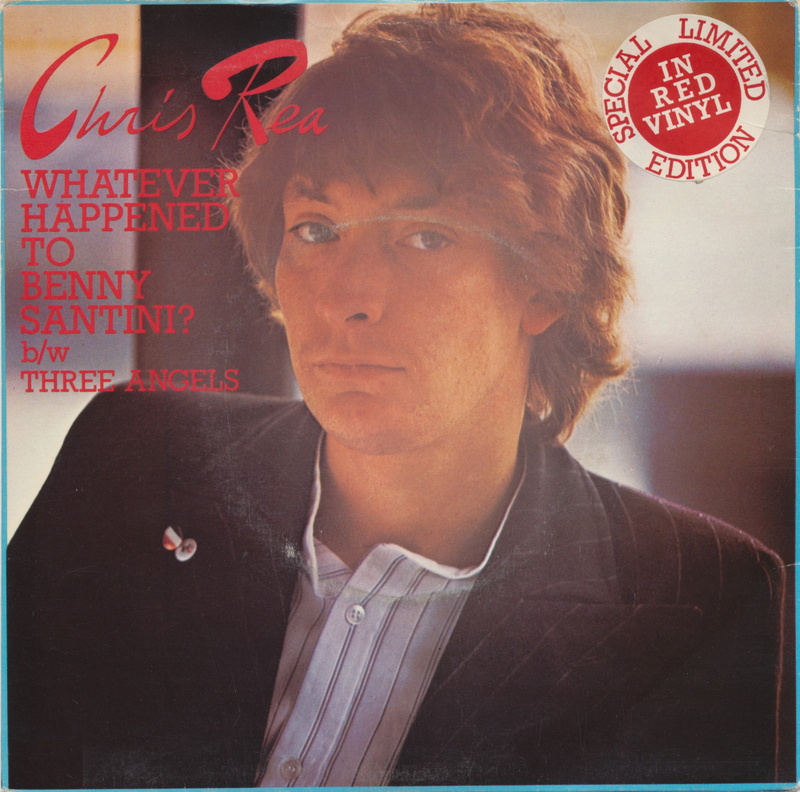 Released in the UK in 1978, this track, the title track of Rea's debut album, was an unsuccessful follow-up to 'Fool (If you think it's over)'. The single did reach number 71 in the US Billboard Hot 100 for some curious reason. I have memories of Abba premiering 'Chiquitita', the song they wrote for Unicef, which was performed at a special concert and broadcast everywhere including the Netherlands. I was only eight years old but somehow the moment stuck in my head. I was never too fond of the song: compared to their earlier songs it was too schmaltzy, too kitsch and too slow for my taste. There was of course one exception: the last few seconds of the song with the impressive piano solo. Being an Abba fan - and having been one for over forty years now, I am proud to say - I have recently acquired all the original German singles of them. It started when I bought the singles box set and saw all these replicas, and I wanted to have the originals as well. I found most of them for less than a euro, and some of them cost a little more - but I am very satisfied to have them all now. 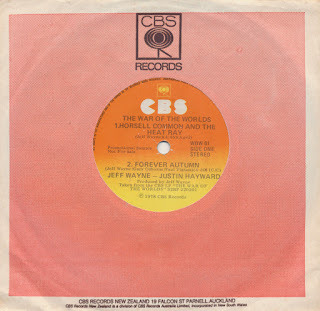 I have started looking into the rarer singles - as long as they are not insanely expensive, like most 'weird' Abba singles tend to be. 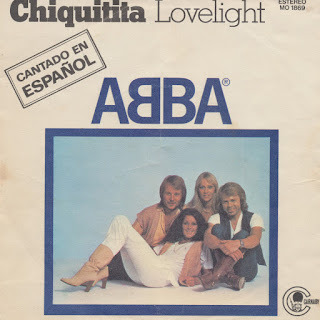 This Spanish version of 'Chiquitita' is my most recent Abba acquisition. I couldn't fault the price and it was nice to reacquaint myself with this little beauty. I think I like the Spanish version a little better than the original version, in fact!